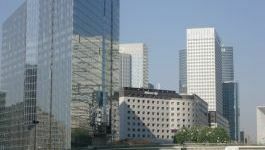 (CercleFinance.com) - Nexity today announces that the consortium of property developers that is comprised of AG Real Estate, Icade, Les Nouveaux Constructeurs and Nexity, associated with the Frey trade specialist, has been awarded the call for projects entitled "Inventer Bruneseau", a tender that has been organised by the City of Paris and Semapa. The Nouvel R project concerns the construction of a project of almost 100,000 m² to create a real link between Paris and Ivry-sur-Seine. This is an ambitious project that will make Bruneseau the first carbon-free district in France, Nexity explained. In detail, the project includes 25,000 m2 of offices, 50,000 m2 of housing and 20,000 m2 of shops and businesses.